Sometimes it is all about the sauce. The best part of this meal is really the sauce. 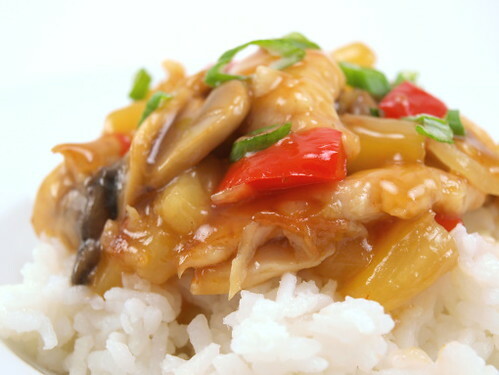 It is the right combination of tangy and sweet, unlike the neon red sauces served by most Chinese carry-out places. 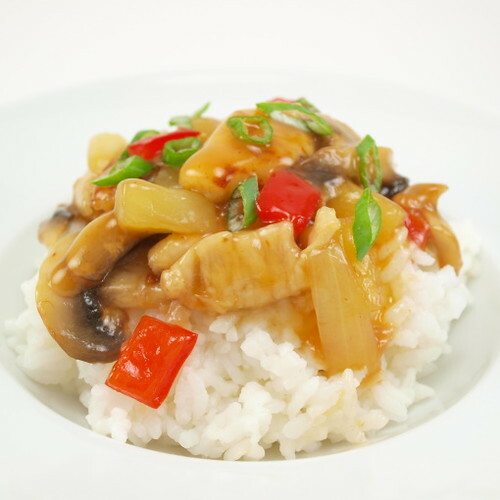 Not to say my mixture of chicken and vegetables in this dish are not fantastic, because they are, but it is the sauce that makes this dish such a superstar. 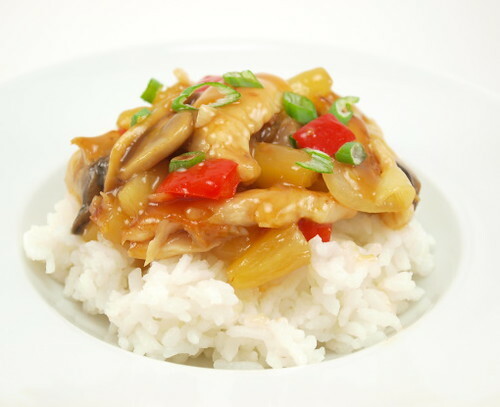 Aside from being really good, it is really easy and fairly quick to put this meal together, making it a good weeknight meal option. You can use whatever combination of meat and vegetables you prefer but don’t leave out the pineapple. You could even make this meatless and it would be delicious. I typically make a double batch of the sauce and use the left-overs to coat roast chickens, toss with baked chicken wings, and serve with egg rolls for dipping. 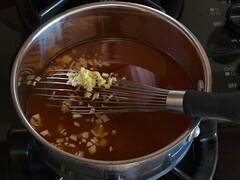 In a medium saucepan combine the water, pineapple juice, sugar, vinegar, soy sauce, ketchup, garlic, and ginger. Bring to a boil over medium heat then reduce to a simmer and allow to reduce by half. 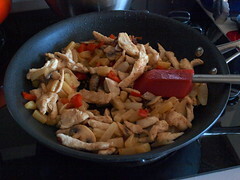 While the sauce reduces heat half of the vegetable oil in a heavy skillet over medium heat. 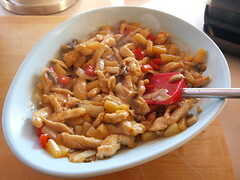 Add the chicken chunks and cook until the internal temperature reaches 160F and the chicken is lightly browned. Remove the chicken from the pan and set aside. 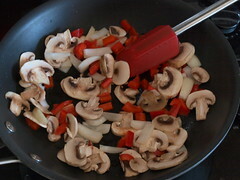 Add the remaining oil and once it shimmers add the bell peppers, onions, and mushrooms. Cook until they are just tender, about three minutes. 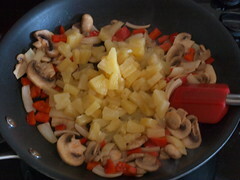 Add the pineapple and cook until the pineapple is hot and tender, another three minutes. Add the chicken back to the pan and heat through. 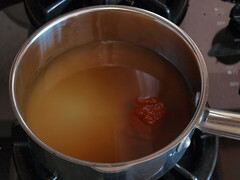 Once the sauce has reduced mix the cornstarch and water to form a slurry. Bring the sauce back to a boil an whisk in the slurry. Cook for thirty seconds then turn off the heat. Pour half the sauce over the chicken mixture and toss to coat. 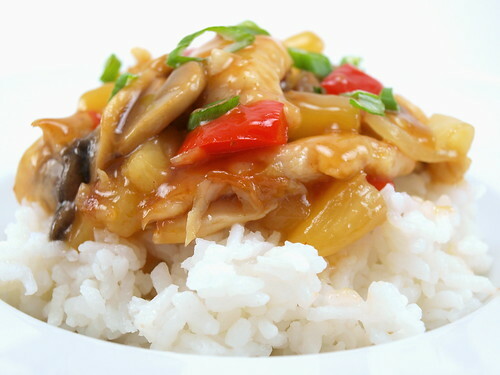 Serve immediately over steamed rice with the extra sauce on the side.